April 6 is National Caramel Corn Day. What better way to celebrate than with a big bowl of homemade caramel corn. You can read about the origin of caramel corn and get the recipe below! Is there any snack more satisfying than caramel corn? Years ago, caramel corn use to be a staple for Halloween. People often made caramel popcorn balls to hand out to trick or treaters. Caramel popcorn was first introduced in 1870 by Frederick and Louis Rueckheim, two German brothers, who immigrated to the US and lived in Chicago. Their mix of popcorn, molasses and peanuts was one of their most popular items. One patron who tried the mix, shouted out "That's a crackerjack! ", which in those days meant it was a great quality product. Years later, the brothers registered the name, and Cracker Jack® was born. Over the years, since then, people have been creating all kinds of different toppings for popcorn, but caramel has always been the most popular. 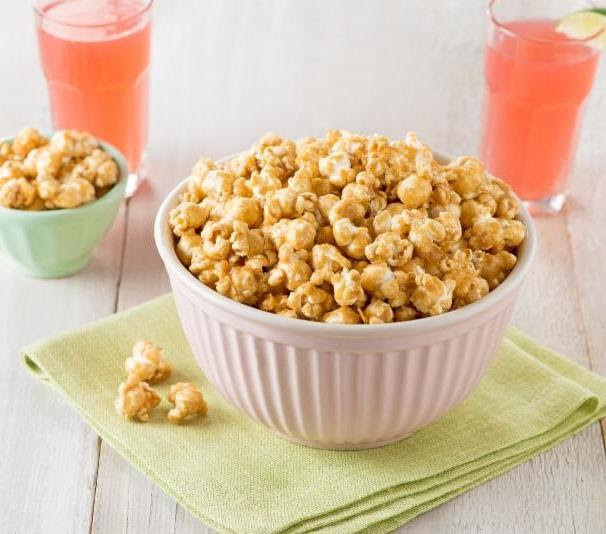 Today, people continue to make caramel corn using mixture of sugar or molasses and heating it up until it caramelizes into a beautiful golden brown, then pouring it slowly over a big bowl of fresh popped corn. Many even enjoy adding nuts to the mixture to give it a bit protein. Caramel corn is one of the most popular flavors today and is a top gift choice during holidays and special occasions. Families enjoy caramel corn on the boardwalks, and kids often enjoy it at baseball games and entertainment events. It is often sold in tins, bags and boxes. Caramel corn makes a great alternative to traditional sweets. My favorite way to enjoy caramel corn is Chicago style, which is a mix of caramel corn and cheese popcorn. What is your favorite variety? Enjoy this recipe from Popcorn.Org ! Make it with your kids and teach them all about the fun treat! This is a history lesson they won't mind learning! Place popcorn in a large bowl; remove any unpopped kernels. Spray a large baking sheet with cooking spray; set aside. In a large, deep pot, stir together brown sugar, butter, corn syrup and salt over medium heat until well blended. Increase heat and bring to a boil. Allow to boil for 5 minutes; DO NOT STIR. Remove pan from heat and stir in baking soda (mixture will foam). Quickly stir popcorn into hot mixture until completely coated. Spread onto prepared baking sheet and allow to cool. Break into smaller pieces. Serve immediately or store in an airtight container. Interesting post. I remember as a little girl one of our neighbors always handed out popcorn balls at Halloween and they were so good! Thank you! I use to like getting them too! This sounds like it would be really good. I'll try to make it with my granddaughters over spring break. This looks like a great recipe. I would love to make this recipe. Aw, I missed National Caramel Day?? And I love caramel. I guess I'll just have to celebrate a little late.